I’m in the design stage of making four bookshelf speaker stands to modernize the TV room. There was a “Z” shaped one here some time back with the base and top screwed into the angled post. I’m thinking of something like that but a little sturdier and thought of finger-jointing the lamination. Attached is a sketch of either the bottom or top of the central core. More laminations will broaden the base and top. It’s comprised of five layers of 5/4 stock with an 81 degree lean. Sticking all of the pieces together at the same time looks problematic so I think it makes sense to make the laminations separately. Even then, I expect getting the interior short pieces to line up exactly will be tricky—especially under clamping pressure. I’ll leave the long pieces oversized and trim them on the table saw after glue-up. board in terms of joinery. Do you have a planer? Sorry Loren, I didn’t explain myself very well. 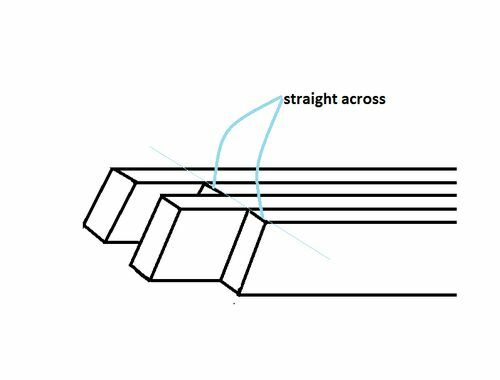 Basically what I’m thinking is finger-jointing a fairly large board at 19 degrees off perpendicular. If I do it as a laminate, I have to get the edges of the short boards exactly in line and square to the length—three of them on the horizontal pieces and two on the angled center post. The long boards can be oversized because I’ll lop them flush on the table-saw after assembly. Five boards with slippery glue will want to wiggle no matter how many clamps I have holding them down. Running it through the planer mills it square but it doesn’t mean I’ll get my perfect perpendicular. I could also use solid stock and make a table-saw jig to rip the fingers. I have a smaller 90 degree version for making boxes with a dado blade now. Or I could laminate the boards reasonably close to the illustration and clean it up on the TS jig so I don’t have to hog so much stock. Then I still have to chisel the surfaces square. If anyone has some ideas how to make the lamination with a sure-fire alignment, I hope you’ll share it. Dowels. Make yourself a custom doweling jig to fit the odd shape and dowel the inside faces. 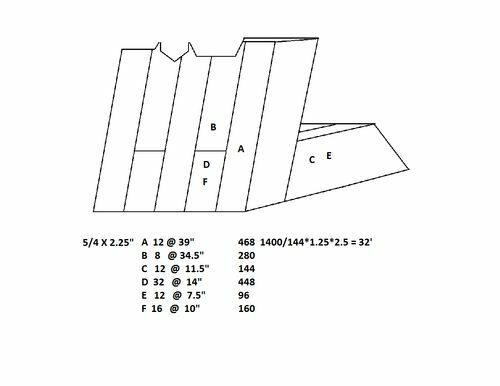 I thought I understood your joinery/glue-up question but may be confused by your follow-up post. Anyway, I can think of two ways that could be considered for gluing and assembling this joint to yield a bookshelf speaker stands supported by an angled post. The first would be to glue up and true the post, base, and top. Beyond that, the pieces could be cut to the desired angle. Then, with a finger jointing jig whose fence is angled so that ends of the workpieces set flush on the table saw, the fingers and finger pockets could be cut as you cut finger joints at 90 degrees. If the glue-ups are initially long, the cut-off pieces could be used to dial-in the finger spacing. The other method would be to cut the individual pieces to the proper length and with the ends cut at the proper miter. Then, the base could be glued-up using off-cuts from the post as spacers to set the fingers in the correct position. To prevent the off-cuts being glued in place, the off-cuts would be removed once the base glue-up is in the clamps. After the base is out of the clamps it can be flushed up. The top would be glued in the same manner. The post would be similarly glued, but the base and the top would be the spacers to set the post planks in in position. Once the post glue-up is in the clamps, the base and top are removed to prevent the base and top from being glued in place. Once the post is flushed up, all the finger joints could be glued. This method would require some special cauls to ensure 90 degree clamping force and to ensure the ends of the assemblies line up. It also requires that all the material is milled identically. This method would likely leave the fingers of the base, post, and top proud of the surfaces by the amount of material removed when each glue-up was flushed up. The proud end-grain of the fingers can be sanded flush. Of the two methods, the first method would be easier for me to execute. Unless you like the look of the finger joint, splined mitre joints would be faster and easier than either method I suggest. After I posted this it occured to me that boards run flat into the table-saw with the blade at full height gets me pretty close to the rough angle I need. That would cut down on hogging. More sensibly, If I just use 8/4 stock with two toes, the interior short piece can be cut exact and the outside longer pieces cut after assembly. The pieces with two short boards on the outside can be cut on the table-saw after assembly too. I don’t get as much grain-2-grain strength as with 1” stock but this only has to hold a 15 lb. speaker. It also has to be cat and puppy-proof —or puppy-resistant anyway. I thought about the splines but the idea is to give this support against being squeezed in. It will want to open like a hinge. With splines I’ve got end-grain on end-grain for most of the surface. Splines cut to look like fingers should be stronger. A hidden spline running the length of the gluing surface—not so much. It would have to be cut with the grain running perpendicular to the spline. I’ve used BB ply in situations like that. I’m not married to any of this but the idea of making a TS jig to support a hunk of oak that big and then tuning it for every cut seems unwieldy.